The Thomas Wayne Batman from DC Comics' Flashpoint! 12-inch tall Real Action Heroes 1:6 scale figure. Comes with extra muscle parts, interchangeable hands, a cloth outfit, and display stand. 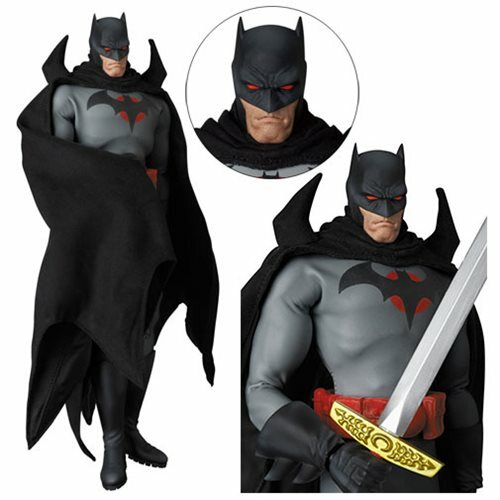 This exciting 12-inch tall plastic DC Flashpoint Batman Real Action Heroes 1:6 Scale Figure presents the Thomas Wayne Batman from DC Comics' 2011 Flashpoint storyline. Featuring a darker, older Batman from a timeline where Bruce Wayne died as a child, he comes with extra muscle parts, interchangeable hands, a cloth outfit, and a display stand. Ages 15 and up. DC Comics' 2011 storyline Flashpoint set the stage for The New 52 relaunch of DC's superhero lineup, and Batman - aka Thomas Wayne - was a major player.